I have been feeling it in my bones. The crisp air in the evenings and mornings, the flaming leaves in the mountains, the delicious smell of new notebooks and pencils, and the subtle desire for heartier foods and cocoa all whisper the same thing. My rooms smell of pumpkin and cinnamon candles, and the vibrant pumpkins and gourds decorate my table. These are all the signs that it is nigh. To celebrate, the children and I gathered in the van for our annual pilgrimage up into the mountains to see the leaves. We headed for the library first, to stock up on books to devour and listen to while breathing in the soul fortifying sights and smells. The sky was smokey from a fire in Idaho which cast a dingy gray shadow over the vibrant azure it was supposed to be. I figured once in the mountains the air would clear up a bit. I was wrong. We drove up there, oohing and aahing at the teasing splashes of color. Though it was always slightly tainted by the smirched sky, sucking a lot of the joy out of seeing the leaves. I think part of the beauty is the contrast of the leaves against that glittering sapphire heaven. Since it was too hard too see and very anticlimactic, we decided to go to Salt Lake and find something to do there. By this time, tummies were rumbling, the story playing over the speakers was being ignored and there was a whole lot of grumpiness going on. My cue to find us some food. Our original plan had been to go to Taggarts to watch the peacocks and eat, but that wasn't going to work anymore. I didn't want to get fast food, as that would help moods, but not tummies. So after driving for a while, a great idea hatched in my mind. Temple Square would have everything we needed. A potty for Faye (who has been in big girl undies for a week now! ), delicious and healthy food for all of us, and plenty for us to see and do. First we went to the Joseph Smith Memorial Building for the potty. Keith was so impressed with the cleanliness and how the stalls sparkled. It made me laugh. We then intended to go see the movie they have playing there, though I did have my reservations on that. I have only seen it once, and that was on my mission. I do remember that I bawled through the end of it, and I have no idea if it is 2 year old appropriate. But first, food! Have you eaten there? So yummy! Everyone was so nice to the lady toting along two very hungry preschoolers (me). I forgot how much I love that place. When we finished eating, we went to the 10th floor to look out and see the scenery. We love seeing the Temple from such great heights. And looking out over the beautiful valley is always awe inspiring. Especially when seen with eyes that have never seen such a view before. As we talked, the thought to go to the Church History Museum came to my mind. 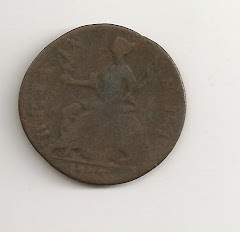 One of the displays has a British half penny from one of Jeffrey's ancestors. The story goes that when he joined the Church, he was completely disowned and disinherited. His father gave him a half penny and told him that was his inheritance. He kept that half penny and saved it to remind him of the great and difficult sacrifice he made to have the gospel of Jesus Christ in his life. It was passed down for years, until it was donated to the Church museum. I wanted the kids to see that and understand how important the gospel is, that such a sacrifice could be made willingly. They were not impressed. They wanted to find the children's area instead of looking at any of the displays. Finally, we made our way up to the children's area. Boy were they happy. There was so much for them to do there! We spent a good two hours going back and forth, running all around. It was like Disney Land to those of us who have never been to Disney Land (which is all three of us). Their favorite part was learning a new dance. Watch it. You will laugh. The kids were so upset when I told them it was time to go. It took a lot of coaxing and cajoling. We did make a stop at the Christus. It isn't a trip to Temple Square without visiting the Christus. The kids loved it. I wish we could have stayed longer and really soaked in the feeling there. Although we didn't get to see the fireworks of fall, we were able to have a edifying and delicious day anyway. We just postponed our trip to the mountains anyway. Attempt number two will be this weekend. Hopefully the sky will stay clear, and the leaves will stay aflame. On the way home, the kids dropped, completely exhausted. I love exhausting them. Really, though, I don't think it matters what we do or did. The time we have together, every single minute, is precious. It is vibrant, and it is exactly what we need. Gosh, I love those kids. The days we spend together are always perfect. Even when there are tantrums and accidents and complete meltdowns, it is perfect. Ohana means family, and family sticks together. How adorable! It's been a long time since we've been tourists in SLC. I'm reminded how much we need to get out that direction again. It is my goal to take my kids to Utah next summer to meet family they have not met and to see Temple Square! So glad it all worked out. And your hair looks adorable! Ohana means family right? I've learned that in Lilo'n Stitch. lol Good to see that you guys had a blast.